"Pressure suits will improve, say the space doctors, but not enough to permit their wearers to work freely in a vacuum for long periods of time. Dr. Fritz Haber of the School of Space Medicine believes that the whole space-suit idea will have to be abandoned. If space men want to float around outside their space ship (as they did in the movie, Destination Moon), they will have to stay inside rigid cylinders and do their work by remote-control devices operated from inside." 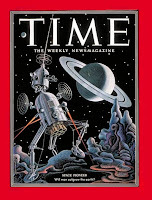 The entire article from the December 8, 1952 issue of TIME magazine can be read here. Heh, hilarious how they were so close to space flight but thought it would be so impossible, reminds me of the old "Humans cannot go faster than 20 miles per hour in a train!" thing.